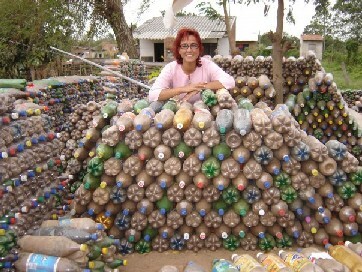 In Bolivia, in the little town of Santa Cruz de la Sierra, Ingrid Vaca Diez collects plastic bottles lying as waste on the streets and use them to build house bricks f0r construction of ecological houses as alternative of living for people who lives in extrme poverty. Her enthusiasm and creative thinking has already changed the reality of life of many families. Ingrid, a lawyer, mix sticking materials like cement, mud, sugar mixed with straw and animal feces and use the plastic and glass bottles filled with sand as bricks. The first house, with an area of 120sqm, became reality in 2007 using approximately: 10.000 plastic bottles of 2 liters, 3.000 plastic bottles of 600 ml and 3.000 glass bottles. Ingrid is actually working on the 4th house and of course with the help of all people that support her to continue into this project , many more will soon start the process of becoming homes. 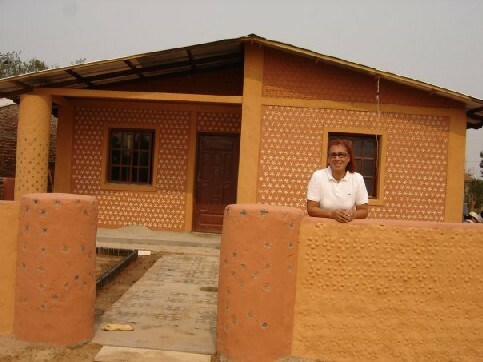 Ingrid’s housing method turn an often human waste into a resource. Additional benefit created during the bulding process is the use and recycle of local house elements like doors, floors, windows, which helps to dercrease the overall transportation whihc means reducing the price of teh house. Many people may think that the success of Ingrid’s Vaca’s housing method depend on waste increase, well it’s the opposite. An empty bottle thrown in the street is waste, while if it is re used into a new life cycle, it comes to be a useful resource. Needless to say that Ingrid is not alone and through the social network facebook she has been able to enroll enthusiastic people ready to help her building up personally and working into this project. Thanks to OSHouse we could read about Ingrid’rs sustainable project and then contact her for more information. Hi, I live in Zimbabwe and i’m involved in various projects that help sustain people here. I have researching on how i can use waste to make something useful to use. I believe renewable energy will help fight poverty and its going to be through the people is hands. Please can you give me more info about making houses out of plastic bottles is there a course on that?